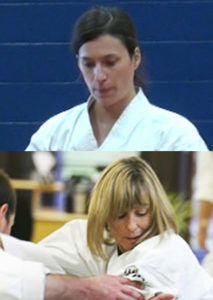 Aikido de la Montagne, in addition to teaching aikido, follows the tradition of teaching iaido as an independent art. The dojo regularly offers introductory sessions in iaido to beginners from 15 years of age and up. These sessions start on a fixed date and last for 3 months. Please consult our schedule, and if necessary, contact us to find out whether it is possible to start at another time. Under the direction of the chief instructor, Claude Berthiaume, the introductory sessions allow you to develop a solid base to progress in the art of drawing the sword, attacking an adversary, and sheathing the sword again. Beyond physical exercise, iaido demands intense mental concentration. During the introductory period you have access to two classes per week. After a first trial class, it is necessary to only wear a white gi (judo or karate style) but if you continue a hakama (skirt-pants worn by the samourai class) will be necessary. As for the iaito (steel-bladed sword), we encourage you to get one relatively soon to deepen your practice. If you do not have an iaito, we can lend you a bokken (wooden sword) until you get one. To see all classes, click here. To register in the introductory program, please arrive on Tuesday or Thursday evening or Saturday morning, 30 minutes before one of the classes available to beginners. You may fill the release form at the dojo or download it here and bring it filled out. You must wear a gi (judo or karate style) except when you do the one free trial class. The dojo has gis for sale. Children under 18 years of age must have a release form signed by their parent or guardian before participating in any dojo activities, even trial classes. To discover what iaido practice can bring you will take more than one class and we encourage you to judge for yourself, to watch a class, or even better to take a free trial class. You can take a free trial class once, any Saturday (1:45pm – 2:45pm) or Wednesday (5:30pm – 6:30pm). Please arrive at the desk near the dojo entrance 30 minutes prior to beginning of the class, and bring a white martial arts uniform (gi) or sports clothing with long sleeves and that covers your legs entirely. You must sign a release form. For the trial class we will lend you a bokken (wooden sword). Bring a pair of slippers or zori. When you enter, you remove your shoes and use your zori to walk around in the dojo. Remove your zori (heels towards mat) when you enter the tatami (training mats). Please use no-one else’s zori but yours. Being on time is important. Do not be late as it is not polite nor is it a good idea to miss the warm-ups at the start of class that prepare you for practice. Leave yourself around 20 minutes to familiarize yourself with the space, change into your gi and to be ready before class. Waiting for the start of class, take advantage of the time to relax and to make the physical and mental preparations you need. Each class starts (and ends) with a bow, signalling respect to previous instructors. Classes start with a warm-up in which different ways of drawing, striking, and sheathing the sword are practiced. Students then practice a series of katas (sequences of movements) individually under the supervision of the Sensei. Aikido de la Montagne teaches the Muso Shinden Ryu style of iaido. In addition, complimentary styles are taught. There are no “kyu” levels in iaido. The first exam is for shodan and it awards you a black belt. To take an exam you must have a minimum number of days of practice and have the approval of the chief instructor. There is an attendence sheet on a bulletin board in the dojo and you should mark and keep track of your hours. Iaido is the art of drawing the sword and striking in a single movement. Originating in feudal Japan, it was systematized by Jinsuke Hayashizaki in 16th century. Iaido is practiced through katas (set sequences of movements). The dojo honors the memory of Mitsunari Kanai Sensei, Shihan (grand master) of iaido. 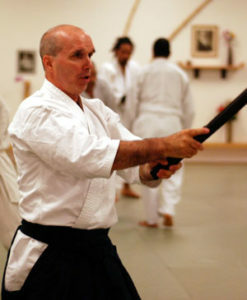 In addition to the strong ties that he had with Claude Berthiaume, his student for thirty years, Kanai Sensei came several times each year to teach iaido at the dojo. Today, Berthiaume Sensei is the technical director of the Kiyoikaze Iaido Federation and is known as the successor of Kanai Sensei and he is called upon to transmit Kanai Sensei’s teachings. To find out more about iaido, its origins and its links with aikido, please visit the Kiyoikaze Iaido Federation website at www.kiyoikaze.org and look for the interview with Mitsunari Kanai. The japanese word “Kiyoikaze” means “pure wind”. Its purpose is to develop and guide the instruction of Iaido as established by Mitsunari Kanai Sensei and carried on by Technical Director, Claude Berthiaume Shihan, Chief Instructor of Aikido de la Montagne, Montreal, Canada.